The Otago Regional Council’s Regional Plan Change 6A (water quality) contains rules to minimise the effects of land use on water quality, including controlling contaminant and sediment loss and work in waterways. Some, if not all these rules will impact all dairy farmers in Otago. Some rules are in force now while others don’t come into effect until 1 April 2020. For a summary of the rules and suggested actions to comply with them, click here. Effluent discharge to land is a permitted activity under the Otago Water Plan. This means you don’t need a consent to discharge effluent to land in Otago, but you will need to comply with the council’s conditions. See a full summary of the ORC water plan rules relating to effluent management here. How can you be sure that your effluent system will meet requirements? 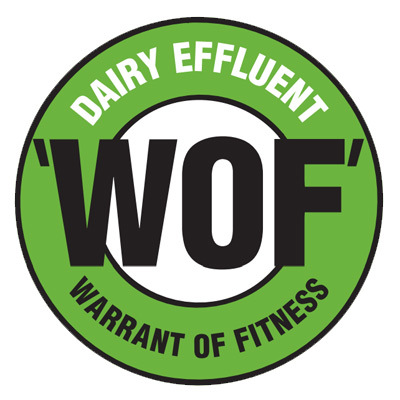 One way is through getting an effluent "Warrant of Fitness" (WOF) assessment of your effluent system. This is a voluntary programme that helps you understand all the requirements to make sure your system is fit for purpose and capable of being compliant 365 days a year. You will receive a brief report with practical actions. The assessment is carried out by a trained and certified independent professional and takes three to four hours. Find out more at www.effluentwof.co.nz. Your milk supply company environmental specialist can help if you have further questions regarding the suitability of your effluent system or if you are considering up-grading. DairyNZ recommends you ensure you understand potential environmental risk on your farm and have a plan to mitigate these as much as possible. This can be done using the DairyNZ EnviroWalk app. This will also help you demonstrate all the good work already being done. You can also contact your dairy supply environmental officer to find out if they can help you with completing an environmental plan for your property. NOSLaM The North Otago Sustainable Land Management Group provides best practice land and water management support and education for the North Otago area. Contact Rob McTague, Coordinator, 021 194 9597, noslamoffice@gmail.com. Clutha Community Trust Clutha Development offer membership to their catchment groups through the Clutha Community Trust. Hanna Stalker, Catchment Engagement Leader, 027 644 2273, hannah.stalker@dairynz.co.nz. Justin Kitto, Water Quality Specialist, 027 702 9832, justin.kitto@dairynz.co.nz. Do you need a consent to continue farming in Otago? Find out here. Your step-by-step guide for successful riparian planting in Otago. DairyNZ has analysed water data for the Pomahaka catchment.